A recent report by the Economic Policy Institute, a Washington, D.C.-based think tank focused on the economic conditions of low- and middle income families, chronicles past struggles and highlight current roadblocks that attempt to dilute the Black vote. The report titled, “Voting Rights at a Crossroads” is the latest in the Unfinished March series that looks at the ambitious goals of the 1963 March on Washington and the work that is still needed to accomplish those goals. According to the report, just one year before the historic march less than 30 percent of voting-aged Blacks were registered to vote in 11 states in the south, where most Blacks lived. A year later, Blacks still faced significant hardships exercising their right to vote. 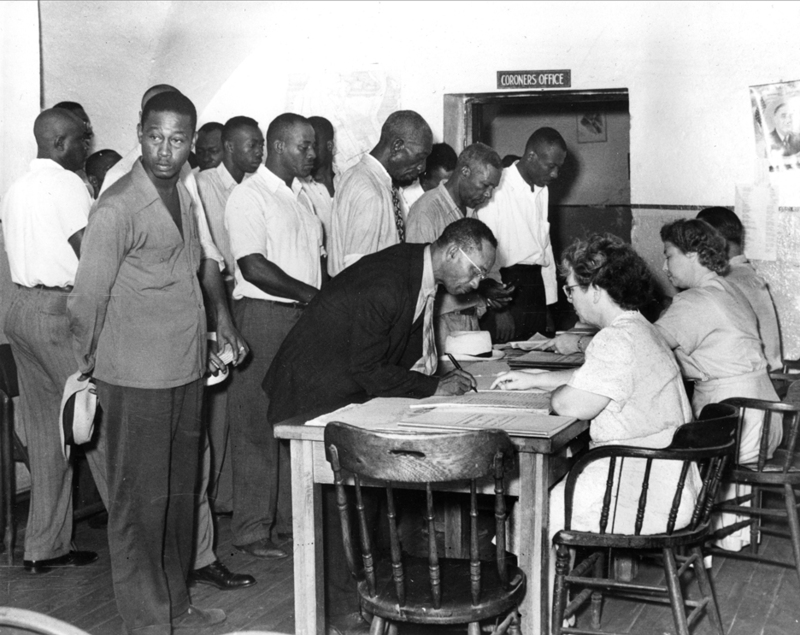 The abysmal voter registration record for Blacks was due largely in part to the discrimination that Blacks faced, often at the hands of state and local officials. Despite a number of federal laws crafted to bolster voter protections under the 15th amendment, state and local officials continued a concerted effort to prevent Blacks from voting, including limiting or changing the registration period, requiring Blacks to get references from Whites to register, literacy tests and poll taxes. When poor Whites complained about some of the laws that limited their voting rights, many states passed “grandfather” clauses that allowed White citizens, who were eligible to vote before the restrictive laws were passed, to continue to vote. The grandfather clauses extended to their descendants and excluded Blacks. The report said that the success of the 1963 March on Washington for Jobs and Freedom inspired civil rights leaders to push for better voting protections under the law. The Voting Rights Act of 1965 changed the political landscape and voting in the United States in ways that the 15th amendment couldn’t. It banned the use of “tests and devices” with Section 2 and installed federal voting officials and observers at polling places. “The Voting Rights Act also contains temporary provisions, including the Section 4 coverage formula and the Section 5 “preclearance ­provision,” which required that jurisdictions with a history of discrimination (as determined by a “coverage formula”) obtain federal approval before implementing any voting change. At first the coverage formula applied to Alabama, Georgia, Louisiana, Mississippi, South Carolina, Virginia, and 40 counties in North Carolina,” stated the report. For decades state and local jurisdictions with the most egregious voting rights violations were forced to pre-clear changes in voting laws. Black voter registration grew. Now nearly 70 percent of voting-aged Blacks are registered. In the 2012 presidential election, Black voter turnout topped White voter turnout for the first time in our nation’s history. More than 66 percent of eligible Black voters went to the polls compared to about 64 percent of registered White voters. The Supreme Court decision in Shelby v. Holder cleared the path for Republican state legislators to pass new laws that threaten to disenfranchise minority voters. When the Supreme Court stripped section 4 of the Voting Right’s Act of 1965, effectively ending protections that voters had under section 5, voters were left virtually to fend for themselves, as politicians launched voting laws restrictive voting laws making it tougher for the young, the old, the poor and minorities to vote. Many southern states led by GOP lawmakers have launched voter ID laws to fight non-existent voter fraud. “The most common example of the harm wrought by imprecise and inflated claims of ‘voter fraud’ is the call for in-person photo identification requirements. Such photo ID laws are effective only in preventing individuals from impersonating other voters at the poll – an occurrence more rare than getting struck by lightning,” stated the Brennan Center report. In Florida, state lawmakers “reinstated a program to purge voters,” a faulty program that was blocked by earlier lawsuits. The report called on citizens to contact members of Congress and to urge them to pass new legislation that would restore section 4 of the VRA and reinvigorate the voter protections under section 5. “The civil rights community and the public must now apply a heightened level of vigilance to ensure that the gains of the past 50 years are not lost, and to continue the historic trajectory of ensuring access to the ballot for all eligible voters,” stated the report.